Indulge in fine dining and first class service with a Flying Scotsman Dining with Distinction experience on 7 & 8 September 2018. Celebrate Flying Scotsman's return to the East Lancashire Railway and relive the prestige of luxury train travel from bygone years with the Flying Scotsman Diner. The evening, which is set on-board our luxurious Pullman style carriages complete with polished marquetry and crisp white table linen, comprises of a four course meal and a glass of fizz and is hauled along our scenic 16 mile route by the famous engine. Celebrate Flying Scotsman’s return to the East Lancashire Railway with our Flying Scotsman Diner. 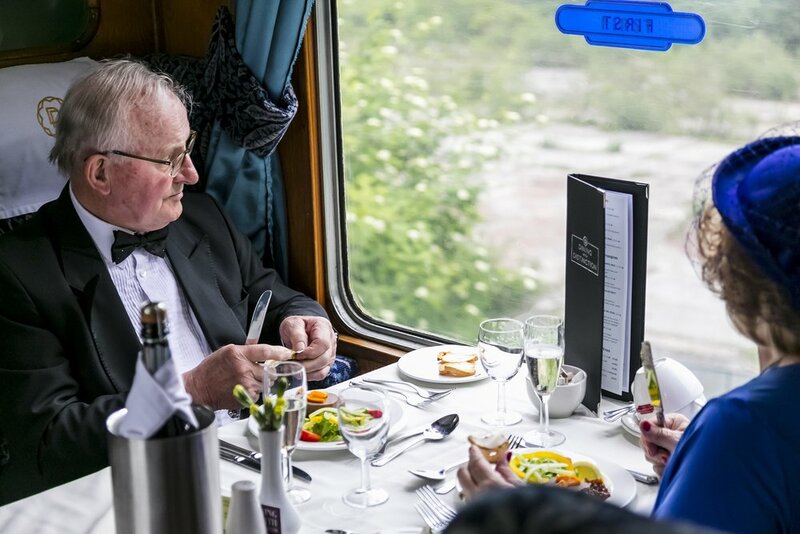 The evening which is set on-board our luxurious Pullman style carriages, comprises of a four course meal and a glass of fizz, and is hauled along a scenic 16 mile route by the famous engine. Starters are served with freshly baked bread rolls. Main courses are served with seasonal local market vegetables and potatoes. Vegetarian options are available and must be pre-ordered when booking. We also cater for any special dietary requirements.